October 1, 2018: Successful 2018 season nearly finished with SPT-3G camera, 1-month until first austral flights arrive. An image of the SPTpol focal plane. The focal plane consists of 768 pixels, each containing two super-conducting transition-edge sensor (TES) bolometers coupled to orthogonal polarizations, for a total of 1536 bolometers. 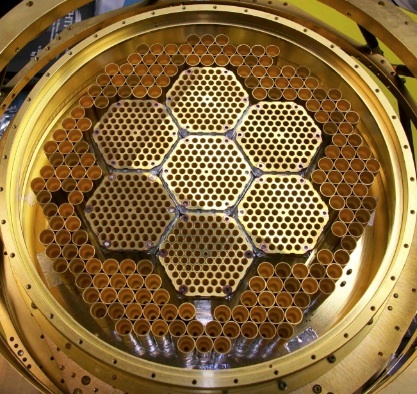 In this image, you are looking down into the gold-plated feedhorns that couple microwave light to the SPTpol detectors. October, 2018: The SPT-3G camera has nearly completed it's 2018 observing season! Winter-overs Joshua Montgomery and Adam Jones have nearly finished a successful 2018 austral-winter observing season at the South Pole! They will continue using SPT-3G to observe the 1500 sq. deg. survey patch for another month, before being relieved by a small austral-summer crew who will perform maintenance and improvements on the telescope and camera. The South Pole Telescope is funded through the National Science Foundation and the Department of Energy Office of Science. Click here to access the SPT Summary of Data Management Principles for DOE.